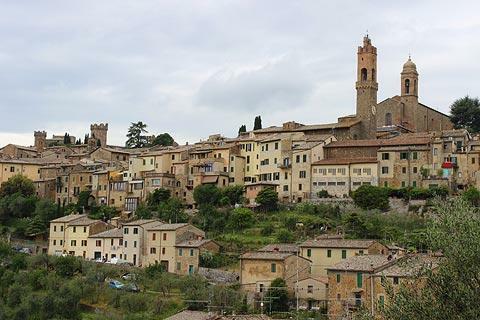 The attractive hill town of Montalcino is one of several interesting medieval towns and villages in the Val d'Orcia to the south of the picturesque Crete Senesi region of central Tuscany and south of Siena and one of the most popular destinations with visitors to the region. 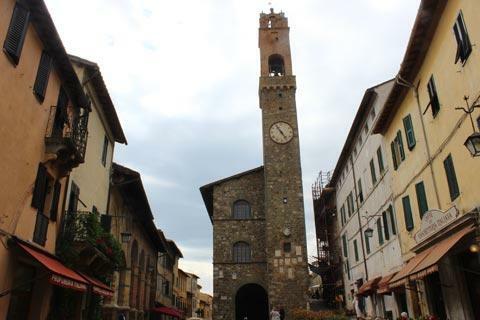 The village is also well know for the Brunello of Montalcino wine produced on the surrounding hills. 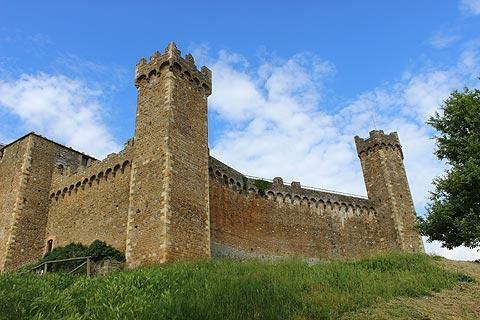 Historic Montalcino is still surrounded by its original defensive walls, some of them dating from the 13th century. There are three entrances through these walls that remain from mediaval times: the Porta Murelli to the north, Porta Castellana to the east and Porta Cervara to the south. If you have arrived by car you are likely to enter through Porta Cervara. 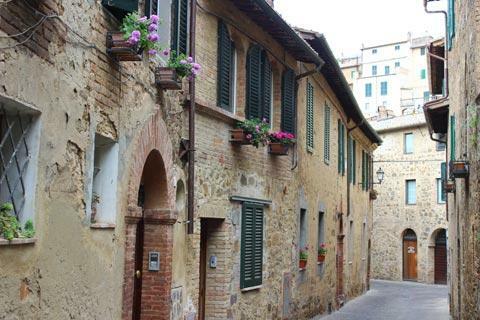 In an case, you won't go far wrong when exploring Montalcino: it is more or less a single street that leads through the village with the fortress at one end, and just a few side streets along the way. The principal pleasure of a visit comes from simply strolling along taking in the ambiance or stopping for a coffee in one of the many cafes, but there are also several monuments of interest that you will discover as you are exploring. 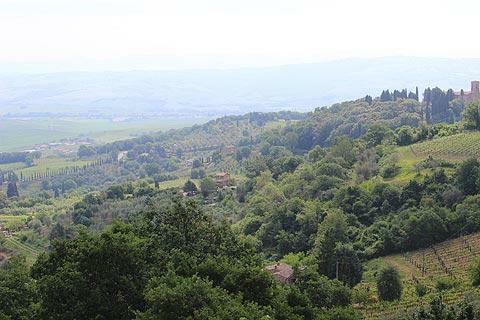 One of these monuments is a substantial and very sturdy 14th century fortress, pentagon in shape and on the southern edge of Montalcino on the highest part of the ridge from where it dominates the town and surveys the surroundings as it has for more than 700 years. Apparently the castle was never successfully defeated. 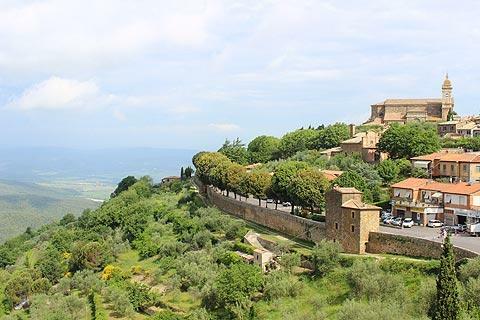 The castle is largely now just a ring of walls: these external walls of the castle incorporate the original defensive walls of the town and a large keep, and you can pay a small charge to walk around the castle walls for lovely views across the Montalcino rooftops. There are also very far-reaching views from the area next to the fortress. 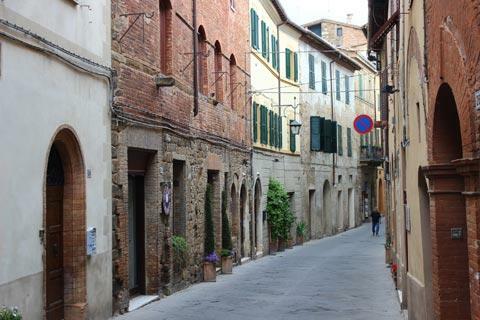 The main street through the town is called Via Matteotti to the south and Via Mazzini to the north and includes various interesting houses and numerous wine shops, cafes and restaurants. In the centre of this street you reach Piazza del Popolo, the heart of the old town. The highlight is the Palazzo Communale with its 13th century tower dominating views across the town and decorated with the coats of arms of the original ruling families - you can't miss it, it is very tall and in the middle of the road! 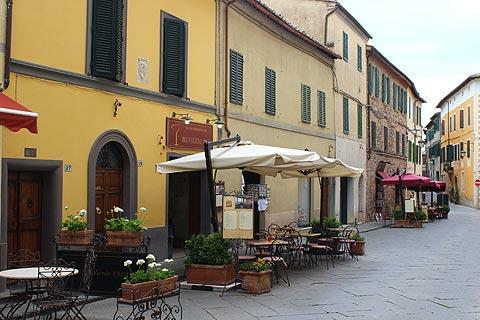 On the same square you can take a look at a Renaissance period double-levelled loggia, and this is also the nicest place to stop for your morning cappucino or afternoon ice-cream. 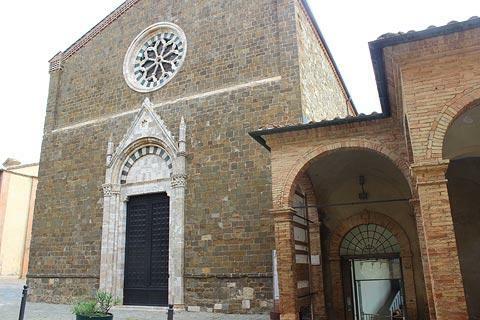 Among the most interesting religious monuments in Montalcino are the 14th century church and monastery of Saint Augustine (Sant'Agostino) on Piazza Garibaldi which contains some frescoes from that period. We also recommend you take a look in the Riuniti Museum here, in particular to see the 15th century wooden and terracotta sculptures. 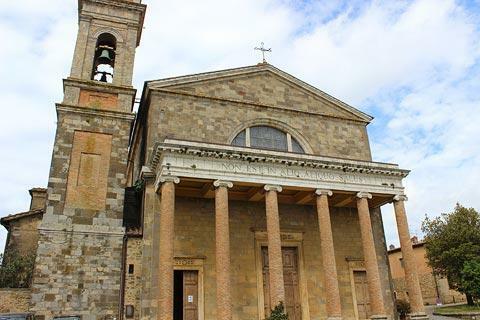 Other churches include the renaissance period Santuario della Madonna del Soccorso near Piazza Cavour at the other end of the town, and the church and medieval hospital and cloisters of San Francesco to the east, near the Porta Castellana entrance to the town. The San Francesco complex is a short walk out of the town centre and was actually rather disappointing to visit, currently being used as a medical centre. Close to the San Francesco hospital you can also see the traditional wash-house, the Fonte Castellane, that would have been centre of village life in the middle ages. 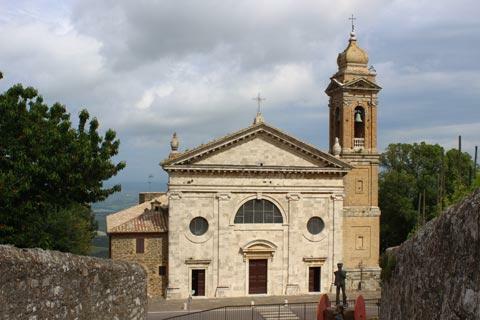 A particular highlight close to Montalcino is a visit to the Abbey of Sant'Antimo, a few kilometres to the south of the town at Castelnuove dell'Abate and in a picturesque countryside setting. Still in use as a Benedictine monastery, the 12th century roman style abbey church is the highlight of your visit to the monastery. The church itself is of a simple design typical of that era, with a semi-circular apse and a tower with small arches inset in larger blind arches. The simple lines of the interior of the Sant'Antimo Abbey church, with the white stone and sturdy columns, also give it a great deal of charm. As well as the church itself, the capital stones (stones at the top of the columns) and frescoes that decorate the interior are also very interesting - several of the frescoes in particular are of very good quality and condition, and the capital stones represent Biblical characters as well as the more commone leaves and plants. 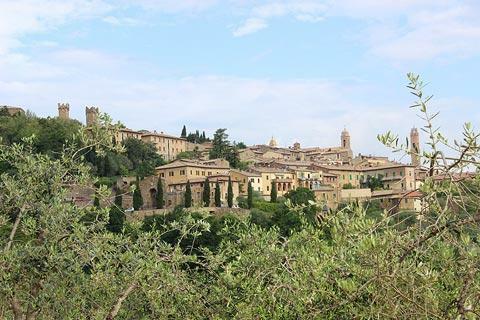 Elsewhere in the surrounding Crete Senesi region the villages of Chianciano, Montepulciano and Pienza (all to the east of Montalcino) are also all very pleasant to visit: Montepulciano and Pienza are among our favourite towns in Tuscany.